Floorplanner is used by more and more companies that offer online interactive floor plans to their clients. Vis-Home, Inc. (USA) is one of those companies but uses Floorplanner in a kind of special way. Instead of drawing their plans directly within floorplanner, they draw the initial floor plans in 2D in their own software and export those results to an interactive, online plan on demand. Through the API they can automatically send the data of the plan from their software to Floorplanner with an interactive 3D floor plan as a result. Vis-Home has been with us from the start and their use of Floorplanner has been growing ever since. 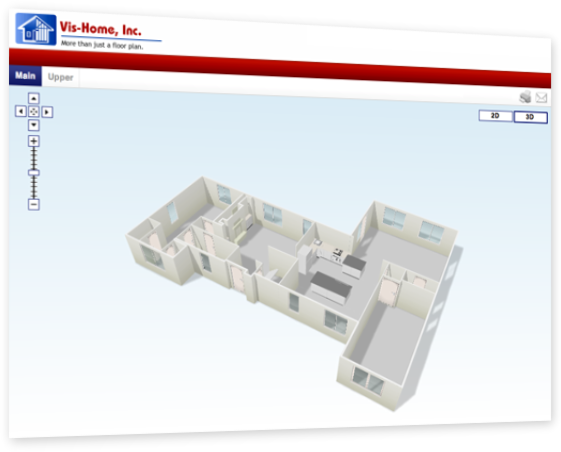 "Vis-Home provides interactive presentations (floor plans + pictures) for real estate listings and Floorplanner furniture planner & 3D viewer are major additions to our product. In fact, we consider Floorplanners to be so valuable that we offer them at no extra cost to our customers. The Floorplanner team is highly professional, very responsive and it is always a pleasure to work with them. For about 2 years that Vis-Home works with Floorplanner we used it for over 6500 properties and we look forward to continue our cooperation." - Alex Eydelman, Owner Vis-Home, Inc.